What Does It Take To Complete An Ironman 70.3? This past Sunday RockMyRun blog contributor, Brock (Co-Owner and Head Trainer with BodyFIT, Inc.) completed his first Ironman 70.3 triathlon! Interested in doing a half or full Ironman one day? 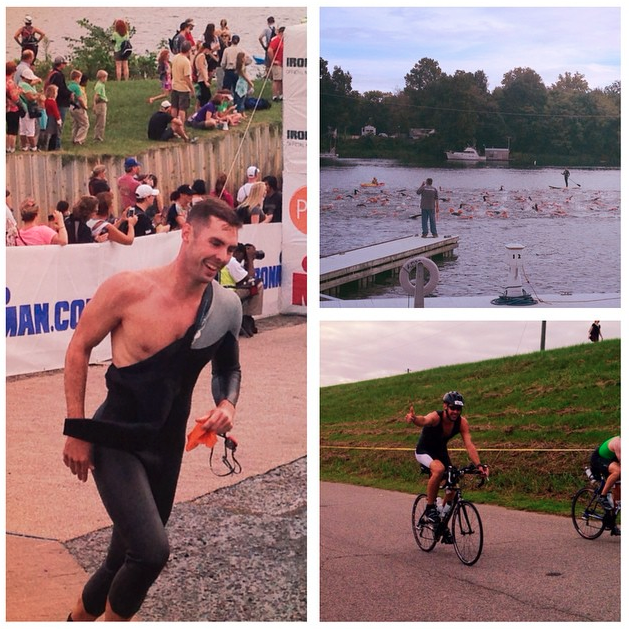 Keep on reading for a summary of the race and an inside look at what the sport entails! This is a picture of the swim start for the IRONMAN 70.3 Augusta race. As you can see you walk out onto a floating dock directly underneath the bridge. As with many other races, the waves went off every four minutes. The cool thing here, though, was that you could jump in the water and get acclimated, or sit on the dock until the horn went off. Most people jumped in to adjust to the cool water. It was really a cool start though, not only because of the scenery, but because you could also see your whole swim directly in front of you. After the start, it takes a few minutes for the faster swimmers to separate themselves, and until they can, you’re stuck kicking and punching the rest of your competitors. I was definitely on the receiving end of a few kicks and punches, but believe me, I handed out more than I got in return. I got in a really good rhythm in the water and was able to separate myself (along with a handful of others) from the majority of the group within a couple of minutes. The swim was downstream, which helped, but I will say I had a good day in the water. Going in a straight line, as opposed to pushing off a wall 80 times, or worrying about rounding multiple buoys, makes it much easier to concentrate on just swimming. And that’s what I was able to do. I was off to a great start! Being that my fiancé didn’t want to/couldn’t follow me for 56 miles (don’t blame her), this is the only photo of me on my bike. After getting to the swim finish and getting out of the wetsuit, it was time to get a quick snack, some water, throw on the helmet and cycling shoes, and get to it. As you can see, the sky was pretty overcast, which made for absolutely perfect weather for a long bike ride. It always takes me a few minutes to get into a good flow on the bike. I’m not sure why, but the first couple of miles seem to be somewhat of a nuisance for me. But, once I got settled in and into a solid speed, it was a great ride. There were a few people who I spoke with before the race that told me the bike ride would be a little hilly, saying there were some pretty solid rolling hills here and there throughout the course. My initial reaction was that I’m from central Kentucky, where every single hill is very rolling and very long, but I didn’t want to be overconfident heading in. I prepared myself accordingly, and planned to pace around 16-17 MPH. I’m not sure if the course was flatter than what had been described to me, I psyched myself up too much for it, or I just felt good, but I had an awesome ride (It was probably a combination of the three). My goal was to finish the 56-mile ride in 3:30, and I ended with a time of 2:59. Let me precede this part by noting how important it is to be fueled up before you get to this point in the race. Water, electrolytes, and just some overall substance in your stomach cannot be stressed enough. You’ve got anywhere from 2:00 to 4:00 on the bike (depending on skill) to get some nutrition and hydration in you, and you have to take advantage. I took advantage, but not nearly enough, as I would come to find out very quickly. This is a little before the mile 4 marker, and also one of the last times I was seen with a smile on my face until the race was over. After getting back to the transition, hopping off the bike, grabbing a banana and some water, I was off on the run. The first three miles felt fine. I was in a pretty decent groove – albeit a slow one – and looking forward to the rest of the run. Then mile five hit me like a ton of bricks. This time it wasn’t the weather (I don’t think it got above 80 degrees) or the course (flat as an ironing board). It was my nutrition, or lack thereof. I could tell around the mile five point that I was beginning to get a bit dehydrated. I have a pretty sensitive stomach during races, and didn’t really want to try anything new during the race, so I stuck with water and the occasional half banana. But, it was simply too little too late. Around the eight or nine mile point, the cramps started setting in. I hate to admit, but this is when the run/walk method came into play. 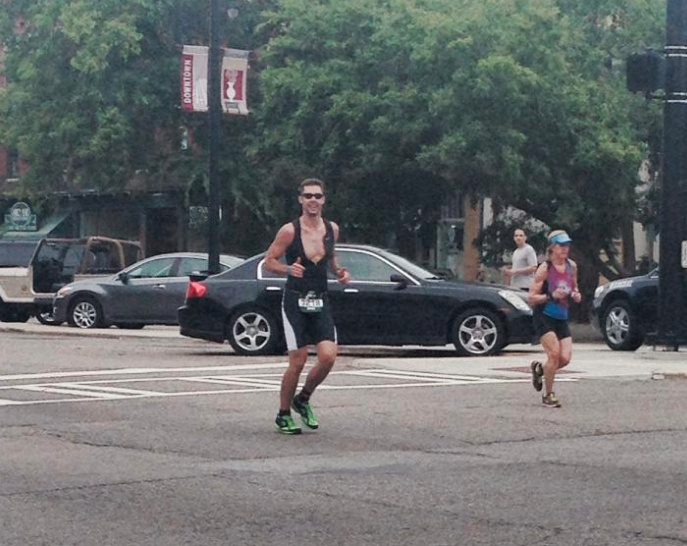 I don’t like to walk during races, but honestly that’s the only way I was going to finish this race. And there’s no way in hell I wasn’t finishing this race. I’ve got too much pride for that. I managed to finish the last 4 – 5 miles and cross the finish line with a time of 2:30 for the run. It was much slower than my goal time, but, being a rookie in this event, I won’t complain. I have to say, after a little time to reflect, this was unlike anything I’ve been a part of. By far, without any doubt at all, this was the hardest race I’ve done. The three events individually, sure, they’d be very manageable. But putting them all together and you’re looking at a whole new beast. And when I say that I went through about every emotion possible, I’m not exaggerating. Starting the race, I was feeling great. I killed the swim and beat my goal on the bike. But then it all came full circle on the run. The course setup did me no favors either. It was a loop course that we ran twice, and had plenty of turns throughout. Those turns resulted in passing the finish line FOUR times before actually crossing. Pairing that with the shutdown mode that my body was going into made for a lot of different emotions throughout the run. This was the closest my body has ever come to physically failing – due to inadequate nutrition – but I was able to stay strong enough mentally to see it through to the end. And let me tell you, nothing is more demoralizing that watching others finish, knowing you still have seven or eight miles left to go. It tests your will and determination. But that’s what an Ironman is all about! Overall, even with my struggles on the run, it was a great weekend. I set a goal of 6:30 and, even with my struggle on the run, finished with a time of 6:10. It was challenging, miserable, inspiring, fun, frustrating, and completely awesome all at the same time. Immediately after the race I told myself I would stick to shorter distances for a while. But, after a few bottles of Gatorade knocked some sense back into my brain, I know I’ll be back again for more. Hey i set my goal to do a 70.3 in 2017 but im kinda out of shape big time just want to know what would you do?